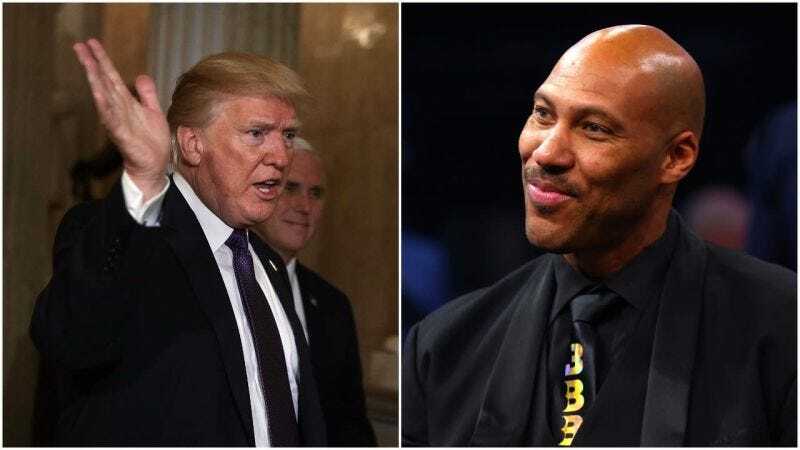 It was inevitable, heading into 2018, that famous basketball dad LaVar Ball’s relentless self-promotion would collide with famous Twitter user Donald Trump’s penchant for race-baiting and petty culture wars. Now that it has happened—with Ball’s middle son, LiAngelo, getting detained for shoplifting in China, supposedly freed with help from Trump, and then tossed aside as the two older men began slap-fighting about who deserves the credit—it has begun creating television of absolutely astonishing surreality. Ball begins by goading Cuomo onto his turf, derailing substantive questioning with instead a demand to be thanked immediately. Cuomo eventually acquiesces, then confuses the preceding interaction as engaging banter, and so counters by demanding a thank-you of his own. This morphed, through no real conscious effort of either participant, into a brief discussion of whether or not Donald Trump deserved a thank-you—which was, if you can remember anything preceding this labyrinth of grinning idiocy, the impetus for this conversation. The Trump talking point does not last long, however, before the two return to some musings about the nature of thank-yous and when they’re merited. Of course, among Ball’s “fans,” television like this is just further proof of his media-exploiting genius, a “master trolling” that only they perceive and properly enjoy. That could be true. Or, as with Donald Trump, it could merely be what happens when you leave the camera running for too long on a person whose only understanding of worth is whether or not people are looking at him, as well as a media environment that likewise refuses to differentiate between good or bad attention. One can envision a sort of primal feedback loop emerging between the two men, with the media playing a hesitant interlocutory role, before eventually the two take directly to YouTube and then, eventually, their own websites, where they will shout salutations at one another in a decreasingly convincing facsimile of human behavior. In the meantime, it has provided a terrific philosophical prompt on the nature of giving thanks, just in time for Thanksgiving. So, thanks, LaVar.